The Elf on the Shelf is a family Christmas tradition that continues to grow in popularity each year. Millions of households bring out their elf from Thanksgiving to Christmas Eve. Parents and kids alike enjoy the fun and games behind this elf and his special mission to fly to the North Pole to report to Santa Claus every night. Find out if you should bring home an elf for your family in this in-depth review of the Elf on the Shelf Christmas tradition. Some families may not like the idea of the elf, such as spying on your kids and reporting behavior to Santa. The elf is top heavy with felt legs. The elf would be easier to pose if it was bendable. 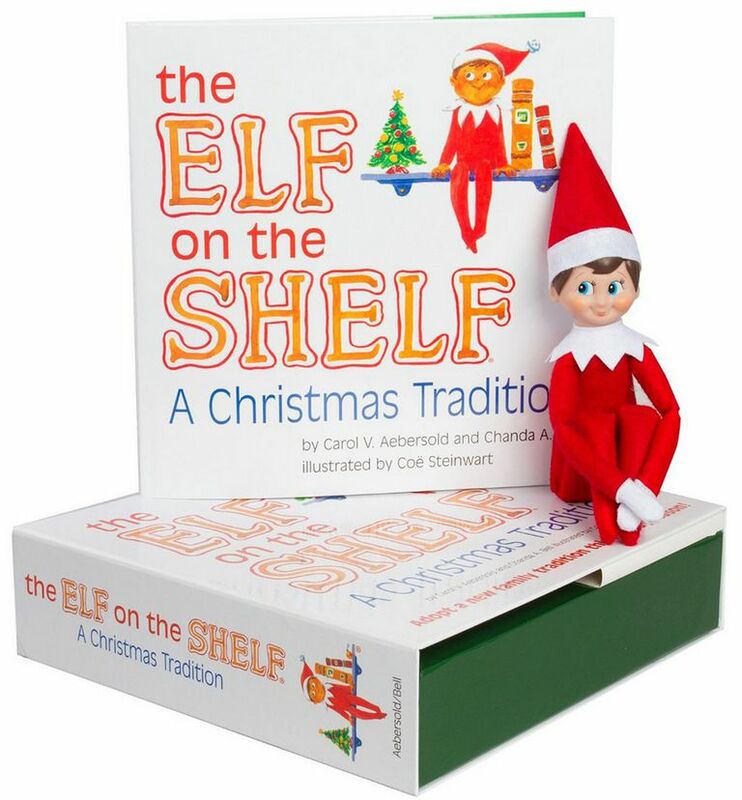 When you open your The Elf on the Shelf keepsake box, you'll find a hardcover storybook and your elf inside. The storybook explains everything you need to know about your elf. Consider it a clever instruction book for adults and an introduction to the elf's purpose for the kids. The Elf on the Shelf's premise is simple. Every night mom or dad hides the elf in a new place. Your children wake up each morning and search the house to see where the elf has reappeared. Every night, the elf flies to the North Pole to tell Santa Claus whether your children have been naughty or nice. It's a cute way to keep the spirit of Santa alive. The golden rule to follow is that the kids can't touch the elf. The night before Christmas, the elf flies off one last time until next year. After you name your elf, visit the Elf on the Shelf website to register your elf. Your child will then receive a special message from Santa. The Elf on the Shelf isn't for everyone. Your kids may be too old or you may not like the idea of an elf who spies on your children and runs to Santa to tell of their behavior. In our house, we don't use the elf as a way to get our kids to behave before Christmas. The elf is part of a fun game we play together. Our oldest is five and our elf tradition began when he was four. Every morning he searches for his elf. He thinks of finding the elf as a game and checks on him several times throughout the day to make sure the elf is still there. Now that he's older, we've made our elf mischievous to keep our kids entertained. Our elf has been known to put our boys' shoes in the refrigerator, doodle on family pictures with a dry erase marker and make snow angels in the middle of the kitchen floor with flour. For our five year old, this is hysterical fun. Every morning, he looks forward to finding Clancy, the name of our elf. We have to search the house to discover Clancy's overnight hijinks. It's a great way to start the day and get everyone into the holiday spirit. At the end of our elf's run for the year, we leave a small present under the tree for the kids. This one's special because it's from our elf Clancy as a way to say goodbye and thanks for the laughs. Follow The Elf on the Shelf book exactly, adapt the story to your family's own interests or build upon the story to make Christmas about more than just presents. There are plenty of ways to get the most fun out of The Elf on the Shelf. After you pack away your elf on Christmas Eve, set out a small present from your elf to your children. It doesn't have to be a big gift. A pack of candy canes or a Christmas card with the date on it can become part of your family tradition. In 2011, An Elf's Story: The Elf on the Shelf 30-minute animated TV special hit the airwaves for the first time. Watch the show with your family each year in addition to reading the storybook to bring the fun of the elf to life for your kids. Google "Elf on the Shelf ideas" and you'll get plenty of tips on how to make your elf's stay memorable for your kids. Pinterest has a variety of user-submitted ideas on where to hide your elf each morning. For example, put marshmallows in your sink, stick your elf in and he looks like he's taking a bubble bath. Position your elf at your computer's keyboard to make it look like he's writing Santa a letter. Hide your elf in the cupboards to make it look like he's raiding your candy stash. There are countless ideas posted on the Internet and new ones are added every day.